Hi, and thanks again for following our adventures at the Scuppernong Springs Nature Trail. We have been waiting for the right conditions to burn the brush piles at the south end of the trail in the area around the Scuppernong Spring and the Hillside Springs and today was the perfect day. Not only was the wind right and the snow cover right but our righteous friends Carl Baumann and Steve Brasch were able to join Lindsay and I. Although we’ve had a lot of snow and rain lately, the piles were bare and pretty dry and they readily took the fire. Here is the scene before we started burning. Carl and Steve followed behind Lindsay and I using leaf blowers to fan the flames we ignited, which really got the piles going and saved a lot of propane. 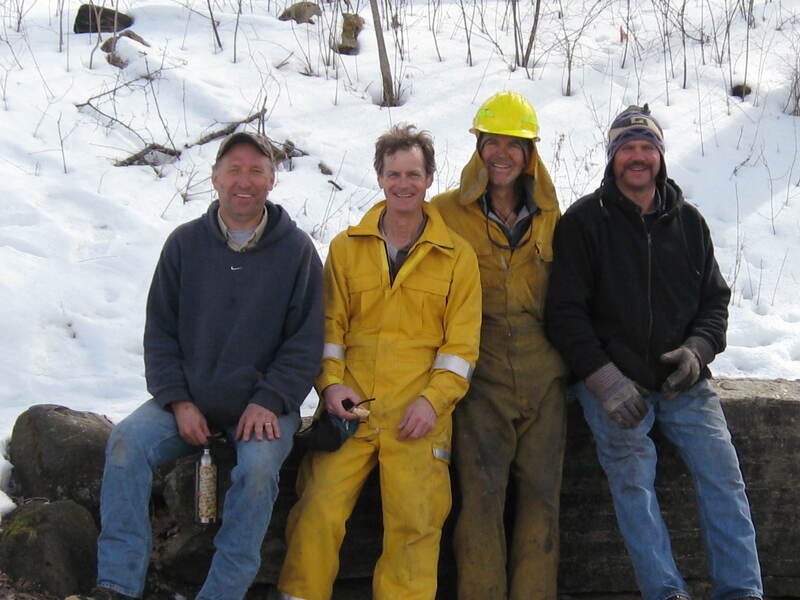 Here is the crew (Steve, Lindsay, Paul and Carl from left to right). The winds were pretty swirly down by the piles but as the smoke rose, it was blown away from Hwy 67 by a predominately northeast breeze. After the 42 fires were “mopped” up, Lindsay, Carl and I took a walk around the trail and we filled Carl in on the details of our plans for the future. It was a splendid day and great fun to work together. This entry was posted in Brush Pile Burning, Hillside Springs, Scuppernong Springs and tagged Brush Pile Burning, Kettle Moraine State Forest, Kettle Moraine Trails, Nature, Scuppernong River, Scuppernong Springs, SouthEastern Wisconsin Hiking Trails by paulmozina. Bookmark the permalink.